Korean kimbap (also known as gimbap) are rice rolls that look a lot like sushi. Traditional fillings for kimbap include seasoned vegetables, egg, meat, and/or imitation crab, but these days anything goes. From Seoul to New York City, fillings range from cheesy to spicy to fresh. Kimbap is like the Korean version of a sandwich—you can change the filling to fit any diet, palate, or occasion. Kim or gim means dried seaweed in Korean, and bap or bop means rice. 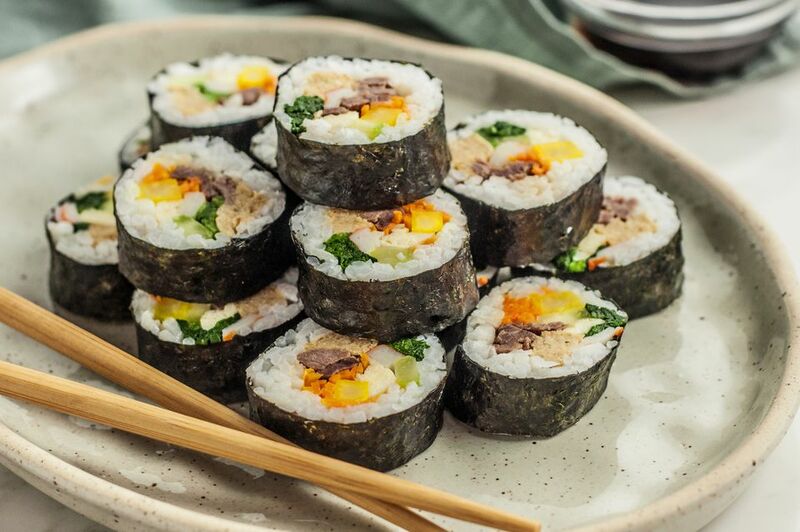 Chamchi (tuna in Korean) is filled with tuna and other vegetables, kimchi kimbap features kimchi as one of its stars, and Chungmu kimbap is a rice-only roll from the city of Chungmu in Korea. Set the dried seaweed sheets aside for the moment. In a medium bowl, mix the lukewarm rice with sesame oil and salt. Set aside. Prepare bulgogi according to recipe directions and reserve 8 ounces for this recipe. Refrigerate or freeze the rest. In a nonstick skillet, stir-fry carrots briefly with a dash of salt, remove from the pan, and set aside. In a nonstick skillet, stir-fry the cucumber with a dash of salt, remove from the pan, and set aside. In a small bowl, whisk the eggs until they are evenly yellow and fry into a flat omelet in a nonstick skillet. Remove from pan and cut the cooked eggs into long strips. Using a bamboo sushi roller or a piece of tin foil, lay one piece of the dried seaweed shiny side down. Spread about 1/2 cup of rice onto 2/3 of the seaweed, leaving the top 1/3 bare. If you moisten your fingers or a spoon to pat down the rice, you'll get less of a sticky mess. Lay 1/4 of the bulgogi down about a third of the way up from the bottom of the seaweed. In single layers, place 1/4 of the other fillings—carrots, cucumbers, eggs, spinach, radishes, optional imitation crab, and fishcake—on top of the bulgogi. Roll from the bottom (as if you're rolling a sleeping bag), pressing down to make the fillings stay in. As you continue to roll, pull the whole thing down toward the end of the bamboo mat. Set aside and repeat with the remaining dried seaweed sheets. Refrigerate until ready to serve. Then, cut each roll into 7 to 8 pieces. The fillings for kimbap are only limited by your creativity. You can go with traditional Korean ingredients or put a new spin on an old favorite.